This page describes the Cretaceous Period, including stratigraphy, paleogeography, and famous lagerstätten, followed by a sketched outline of some of the major evolutionary events. The earliest concept of the Cretaceous was formailsed in 1822 when d’Halloy defined what he called the “Terraine Crétacé”. However, the base of the period has been modified over the years, most recently by the inclusion of the Berriasian as the lowermost stage in the Cretaceous System. Surely the most widely reported – and the most widely misreported – of all extinction events is that which brought the age of the dinosaurs to an end at the close of the Mesozoic: the “KT” extinction. Almost all of the popular and “lightly technical” literature published within the past couple of decades is filled with comet or meteorite impact theories, all ultimately traceable to the father and son team of Luis and Walter Alvarez. Indeed, there is a good body of evidence to support the contention that a large extraterrestrial impact did occur at the very end of the Cretaceous. However, the KT extinction is only one of several such mass extinctions in the Phanerozoic, and by no means the largest. There is no evidence of impacts associated with the other mass extinction events, and very few people try to maintain that argument today. In fact, flood volcanism is the only mechanism which really matches the data. “[L]arge continental flood-basalt volcanic events exhibit a near-perfect stage-level association with marked increases in Mesozoic and Cenozoic extinction intensity. Ten out of the 11 major flood-basalt eruption events of the last 250 million years occur during a stage that contains a local extinction peak (i.e. mass extinction). It is presently unknown whether this association is scale-dependent or extends to smaller events as well” (MacLeod 2002). “Everyone has a favourite theory for major extinctions, all united by the common theme of attributing dominant importance to physical factors, and playing down the importance of normal biological mechanisms. Our own work strongly favours the diversification of both mammals and birds at least 30 million years before the extinction of dinosaurs – there must be ecological consequences for small dinosaurs from this early diversification” (Penny 2001). If an impact was the sole cause of the KT extinctions, then that would make the KT different from the several other mass extinctions known, which is not a parsimonious conclusion. However, if an impact did occur at about that time, which seems likely, no doubt it would have added further stress to the already failing ecosystems, and possibly accelerated or even heightened the extinction event in some places. The GSSP for the base of the Danian Stage (= Cretaceous-Paleogene boundary) was established in 1996 in the clay layer containing the famous “K/T” iridium anomaly and nickel-rich spinels at a section of Oued Djerfane, 8 km west of El Kef, in Tunisia (see Molina et al. 2006). The base of the Cretaceous, though not yet formally defined, is approximately 145 Ma. The top, however, has been very accurately dated: it is 66.04 Ma. At the beginning of the Cretaceous, Pangaea was breaking up into Laurasia in the north and Gondwana in the south. By the end of the period, at least the Gondwana continents had largely separated and were starting to migrate into their present day positions. Paleogeographic reconstruction for the Cretaceous from Christopher Scotese’s excellent ‘Paleomap Project’. Perhaps the most significant evolutionary event of the middle Cretaceous was the great proliferation of angiosperms – the flowering plants. “Until the 1970s not a great deal was known about fossil flowers. Since then our knowledge has grown explosively. For example, the mid-Cretaceous Archaeanthus, from Russell, Kansas, now one of the best-known early flowers, has been the subject of extensive research. The flower is borne terminally on a long axis, and the seeds can be macerated out. The stamens and tepals are known from scars, resin bodies are scattered in the fruit and tepals, and all these features, together with the morphology, indicate an evident relation to the extant Magnoliacea. “Compression flowers in general, however, are rare, and it is usually only the large ones which are seen. Some years ago, sieving techniques used for Tertiary sediments were applied to the Cretaceous, and yielded a previously unimagined diversity of Cretaceous angiosperm flowers, from sites in North America, Sweden, Portugal, Kazachstan, and Japan. It is now becoming clear how lineages are related. The earliest pollen is 135 million years old, and many basal eudicot lineages were fully established by about 110 Ma. Insect pollination is overwhelmingly supported by the evidence, and was probably important for enhancing speciation rates. Once started, the radiation of angiosperms, especially in low latitudes, kept rising, and shows no sign of levelling off in the Tertiary” (Clarkson 1999, p. 53). The most striking event in the evolution of plants during the Cretaceous was certainly the enormous radiation of angiosperms. The angiosperms (flowering plants) are the most diverse group of land plants living today, comprising some 270,000 described species, placed in about 380 families and 83 orders (Mayr 2001, p. 64). Jehol Group: Early Cretaceous Northeastern China; finds include the famous “feathered” dinosaurs, early birds, putative basal angiosperms, and primitive mammals. Detailed soft-tissue preservation of organisms is known. Las Hoyas: Located in Cuenca, Spain; Barremian in age. Most of the skeletal fossils appear articulated, and the exceptional preservation of them has allow to study the fossils in detail, obtaining information not available in other fossil sites. Hell Creek Formation: Montana and the Dakotas; non-marine fluvial channel-fill and floodplain deposits, primarily sandstone, siltstone and mudstone; diachronously overlain by lignites; almost entirely Late Cretaceous but in some places earliest Paleogene at the very top; iridium found in some of the overlying lignites may be related to the “K/T” iridium anomaly; dinosaurs have been known from the Hell Creek Formation since at least Barnum Brown’s AMNH expedition of 1902; diverse assemblage of theropods, ornithopods, pachycephalosaurs, ankylosaurs and ceratopsids, including the type and a few other specimens of Tyrannosaurus rex. See Lofgren 1997. Sierra de Montsech: Cretaceous Spain; fossil spiders, insects, crustaceans and vertebrates; see Selden 1989, 1990. Santana Formation: This spectacular locality is one of the most prolific sources of Early Cretaceous fish fossils. It is located in north east Brazil at the foot of Araripe Plateau, on the border of Ceará State. The fossils occur in shales, thin limestone bands, and commonly in rounded calcareous concretions. The site is most famous for fossil fish, but arthropods, molluscs, dinosaurs and pterosaurs, as well as some plants are also known. Surely the most widely reported – and in the lay media, at least, the most widely misreported – of all extinction events is that which brought the age of the dinosaurs to an end at the close of the Maastrichtian: the “K/T” extinction. Surely the most widely reported – and in the lay media, at least, the most widely misreported – of all extinction events is that which brought the age of the dinosaurs to an end at the close of the Maastrichtian: the “KT” extinction. The exact timing and nature of the end-Cretaceous mass-extinction event is famously contentious, so let us be clear about two things right from the outset: First, a bolide did strike the Earth at the end of the period. In fact, the Cretaceous-Paleogene boundary is essentially defined by this event [→ sidebar], so any suggestion that the impact occurred before or after the end of the Cretaceous is simply nonsensical. But, second, the almost unimaginably vast Deccan Traps volcanism was in full swing at the same time. Both of these events inevitably influenced the climate, the atmosphere, and life, to a great degree. One may reasonably argue about which event had the most influence over a particular group of organisms at a particular place and time, but to adopt one or other phenomenon as a complete explanation for the mass extinction, to the outright exclusion of the other, strikes me as ideological. That is not science. “The idea of mass extinctions of life, traditionally by great floods, still has a strong hold on western imagination. Everyone has a favourite theory for major extinctions, all united by the common theme of attributing dominant importance to physical factors, and playing down the importance of normal biological mechanisms. Our own work strongly favours the diversification of both mammals and birds at least 30 million years before the extinction of dinosaurs – there must be ecological consequences for small dinosaurs from this early diversification” (Penny 2001). Fossil evidence also supports a progressive change in the composition of mammal communities across the K-T boundary, although dating uncertainties have complicated any simple interpretation of this data (e.g. Lofgren 1995). “Recent field and laboratory investigations have established that the latest Cretaceous (i.e. Campanian-Maastrichtian) sedimentary succession exposed within the James Ross Basin, Antarctica is in excess of 2 km in total thickness. Comprising essentially fine-grained, shallow-water, volcaniclastic rocks that are in places intensely fossiliferous, it represents one of the best opportunities to investigate palaeobiological and palaeoenvironmental changes leading up to the K-T boundary anywhere in the southern hemisphere. The exceptionally early extinction patterns of the inoceramid bivalves and belemnites can be confirmed, but it is apparent that other key groups such as the ammonites [also see Witts et al. 2018] and trigoniid bivalves go right up to the boundary itself. Studies throughout the 1000 m thick Maastrichtian sequence indicate that, although molluscan assemblages are abundant, they are never particularly diverse. The benthic element has a distinctly temperate aspect and there is both sedimentological and palaeontological evidence to suggest that it was subjected to periodic intervals of reduced oxygen levels. The comparatively small, but nevertheless still abrupt, extinction event at the end of the Cretaceous in Antarctica may well have been buffered to some extent by both the high-latitude position and unusual sedimentological setting of the basin” (Crame 1999). A number of authorities have reported multiple iridium spikes in the vicinity of the Cretaceous-Tertiary boundary (Ganapathy et al. 1981; Donovan et al. 1988; Graup & Spettel 1989; Bhandari et al. 1995, 1996; Zhao et al. 2002). These observations do not fit comfortably with the theory of a single, massive bolide impact being largely responsible for numerous end-Cretaceous phenomena. In the Nanxiong Basin, China, the evidence suggests that “the K/T event was not marked by an instantaneous geochemical environmental change, but stretched out over a considerable time” (Zhao et al. 2002, p. 10). Moreover, there is some evidence to support the view that the end-Cretaceous extinctions were more gradational, less severe, or both, at high paleolatitudes. For example, Crame et al. 1996 presents a study of Antarctic inoceramids and dimitobelids (a kind of belemnite), and concludes that “we cannot yet separate the effects of changes in water depths, water temperature and predation pressure with absolute certainty. We can, however, show that these groups became extinct exceptionally early in the Antarctic, and this fact alone enhances claims that the instability of polar water masses may have played an important role in bringing about the demise of at least some Late Cretaceous marine taxa” (p. 506). Gradstein et al. 2012 further notes some of the many extinctions which appear to occur at more or less exactly the same time, but these two ideas should not be conflated. The coincidence of the impact ejecta with the base of the Paleogene is a matter of definition whereas the exact timing of many extinctions is still poorly resolved and contentious, and the precise causes even more so. Bhandari, A.; Shukla, P.N. ; Ghevariya, Z.G. ; Sundaram, S.M. 1995: Impact did not trigger Deccan volcanism: Evidence from Anjar K/T boundary layer in Deccan intertrappean sediments. Geophysics Research Letters 22: 433-436. Geo Res Lett. — 1996: K/T boundary layer in Deccan intertrappean at Anjar, Kutch. In Ryder, G. et al. (ed.) 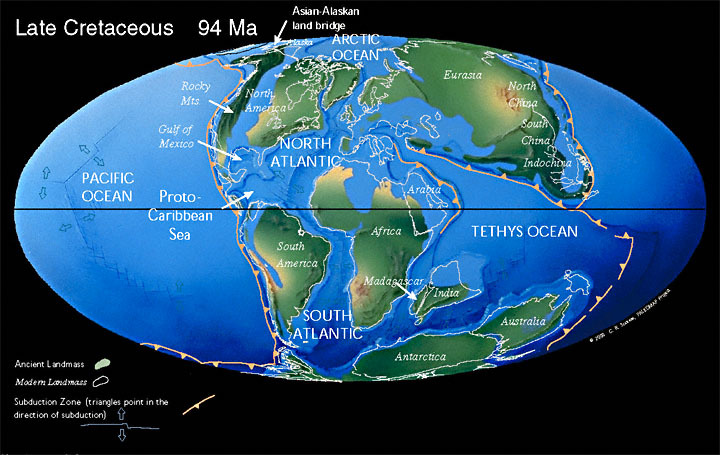 1996: The Cretaceous-Tertiary event and other catastrophes in Earth history . Geological Society of America, Special Paper 307: 417-424. Clarkson, E.N.K. 1999: The Origin of Flowers - Association Annual Address. The Palaeontological Association Newsletter Number 41, p. 53. .
Cleal, C.J. ; Thomas, B.A. 2009: An Introduction to Plant Fossils. Cambridge University Press: 1-248. Crame, A. 1999: Changes in molluscan faunas across the K-T boundary in Antarctica. Palaeontological Association 43rd Annual Meeting, University of Manchester, 19-22 December 1999 (Oral Presentation). Crame, J.A. ; Lomas, S.A.; Pirrie, D.; Luther, A. 1996: Late Cretaceous extinction patterns in Antarctica. Journal of the Gological Society, London 153: 503-506.
d’Halloy, J.G.J.d’O. 1822: Observations sur un essai de cartes géologiques de la France, des Pays-Bas, et des contrées voisines. Annales de Mines 7: 353-376. Donovan, A.D.; Baum, G.R. et al. 1988: Sequence stratigraphic setting of the Cretaceous-Tertiary boundary in Central Alabama. In Wilgus, C.K. et al. (ed.) 1988: Sea-level changes - An integrated approach. Soc. Econ. Paleontol. Mineralog. Special Publication 42: 299-307. Ganapathy, R.; Gartner, S.; Jiang, M. 1981: Iridium anomaly at the Creataceous-Tertiary boundary in Texas. Earth and Planetary Science Letters 54: 393-396. E Pl Sci Lett. Graup, G.; Spettel, B. 1989: Mineralogy and phase-chemistry of an Ir enriched pre-K/T layer from the Lattengebirge, Bavarian Alps, and significance for the KTB problem. Earth and Planetary Science Letters 95: 271-290. E Pl Sci Lett. Lofgren, D.F. 1997: Hell Creek Formation. In Currie, P.J. ; Padian, K. (ed.) 1997: Encyclopedia of dinosaurs. Academic Press: 302-303. Lofgren, D.L. 1995: The Bug Creek Problem and the Cretaceous-Tertiary Transition at McGuire Creek, Montana. University of California Press. MacLeod, N. 2002: Extinction. Nature Encyclopedia of Life Sciences. London: Nature Publishing Group. http://www.els.net/ [doi:10.1038/npg.els.0001650]. Molina, E.; Alegret, L.; Arenillas, I.; Arz, J.A. ; Gallala, N.; Hardenbol, J.; von Salis, K.; Steurbaut, E.; Vandenberghe, N.; Zaghbib-Turki, D. 2006: The Global Boundary Stratotype Section and Point for the base of the Danian Stage (Paleocene, Paleogene, “Tertiary”, Cenozoic) at El Kef, Tunesia - Original definition and revision. Episodes 29: 263-273. Penny, D. 2001: Molecular Evolution: Introduction. Nature Encyclopedia of Life Sciences [doi:10.1038/npg.els.0001701]. Selden, P.A. 1989: Orb-weaving spiders in the early Cretaceous. Nature 340: 711-713. — 1990: Lower Cretaceous spiders from Sierra de Montsech, northeast Spain. Paleontology 33: 257-285. Witts, J.D. ; Landman, N.H.; Garb, M.P. ; Boas, C.; Larina, E.; Rovelli, R.; Edwards, L.E. ; Sherrell, R.M. ; Cochran, J.K. 2018: A fossiliferous spherule-rich bed at the Cretaceous-Paleogene (K-Pg) boundary in Mississippi, USA: Implications for the K-Pg mass extinction event in the Mississippi Embayment and Eastern Gulf Coastal Plain. Cretaceous Research 91: 147-167. Zhao, Z.; Mao, X.; Chai, Z.; Yang, G.; Kong, P.; Ebihara, M.; Zhao, Z. 2002: A possible causal relationship between the extinction of dinosaurs and K/T iridium enrichment in the Nanxiong Basin, South China: evidence from dinosaur eggshells. Palaeogeography, Palaeoclimatology, Palaeoecology 178: 1-17.